In this post, reviews of: Tiger in my Soup by Kashmira Sheth (writer) and Jeffrey Ebbeler (illustrator) (2013, hardcover, Peachtree Publishers); Sona and the Wedding Game by Kashmira Sheth (writer) and Yoshiko Jaeggi (illustrator) (2015, hardcover, Peachtree Publishers); Yumi Sakugawa’s I Think I Am in Friend Love With You (Adams Media, (2013); Yumi Sakugawa’s Your Illustrated Guide to Becoming One with the Universe (Adams Media, 2015); Yumi Sakugawa’s There is No Right Way to Meditate: And Other Lessons (Adams Media, 2016); Kazu Kibuishi’s Firelight (Amulet #7) (Scholastic Press, 2016); Gene Yang (author) and Mike Holmes’s (illustrator) Secret Coders (First Second 2015). May is Asian Pacific American Heritage Month. As part of my acknowledgement of this month, I am attempting to amass 31 reviews, so my rate would come out on average to a review a day in the month of May. Counting this post, I will be up to 13 reviews (if I have completed my addition properly). We’ll see if I’m able to complete this challenge, but as part of this initiative, I’m hoping that my efforts might be matched in some way by you: so if you’re a reader and lurker of AALF, I am encouraging you to make your own post or respond to one of the reviews. Would it be too much to ask for 31 comments and/or posts by readers and others? Probably, but the gauntlet has been thrown. LJ is open access, so you can create your own profile or you can post anonymously. I kindly encourage you to comment just to acknowledge your participation in AALF’s readership. This post is focused on visual cultural productions of numerous kinds, including children’s picture books, graphic novels, and illustrated guides. As with the previous post on young adult fiction, I tend to gravitate toward visual/ textual cultural productions when my mind needs a break from more traditional reading. I wanted to provide a mix of different kinds of visual cultural productions. I’ve definitely taken a break from reviewing children’s picture books, so I figured that I should include some here. The story relies upon the imaginative depictions offered by Jeffrey Ebbeler, which provides the right balance of menace and entertainment. What is interesting about this story for readers of AALF is the fact that the characters seem to be ethnically marked, but are not definitively determined to be so, either through dialogue or textual information. I wondered about the reasoning for this kind of depiction, and the rationale behind it. In any case, on the brief plotting level, the book does a wonderful job considering how a child’s imagination might run wild, to the point that tigers seem to come to life. For the target readers, such a whimsical world of fantasy run gleefully amok will certainly be amusing. Whereas Tiger in my Soup was not so specific about ethnic or cultural contexts, Sona and the Wedding Game goes in the exact opposite direction. The inside cover of the hardcover edition provides us with some useful background information: “Sona has been given an important job for her big sister’s wedding: she has tot steal the groom’s shoes. She’s never attended a wedding before, so she’s unfamiliar with this Indian tradition – as well as many of the other magical experiences that will occur before and during the special event. But with the assistance of her know-it-all cousin Vishal, Sona finds a way to steal the shoes and get a very special reward.” Sheth has her work cut out for her because she needs to be able to render the story legible to young readers, while also maintaining ethnographic accuracy. Part of the success is reliant upon Jaeggi’s artistic style, which is far more realist in its approach than the more cartoon-ish drawings that Ebbeler appropriately provides for Tiger in my Soup. But Sheth also has to rely on more text and a detailed author’s note to give parents more information, which may be important to relay given questions that may come up during the reading experience. Again, it’s really amazing to see these kinds of picture books available these days; I can’t recall having access to such books when I was a young child. A Review of Yumi Sakugawa’s I Think I Am in Friend Love With You (Adams Media, (2013); Your Illustrated Guide to Becoming One with the Universe (Adams Media, 2015); and There is No Right Way to Meditate: And Other Lessons (Adams Media, 2016). I absolutely adored I Think I Am in Friend Love with You for the simply reason that the English language is so terrible about finding a way to move beyond the binaries of friend and lover, acquaintance and family member. I have often found my friendships to be as deep and as meaningful as any other connection I have made; love is certainly part of that equation, but not necessarily a romantic love. Thus, I really found Yumi Sakugawa’s I Think I Am in Friend Love With You to explore this strange liminal space of the “friend love.” As with Sakugawa’s other works, I am always reminded of Spirited Away, as Sakugawa typically uses anthropomorphic blob-like cartoons, which nevertheless seem appropriate because she’s always exploring feelings and emotions. I have to believe that many of us are in “friend love” or at least have strong platonic relationships that might be better categorized as something akin to family, but again, we have yet to develop the kind of language to mark precisely these connections. As a final note, I did end up reading selections of this piece to a person who I consider to be a “friend love,” and it was an entertaining experience. Your Illustrated Guide to Becoming One with the Universe is another publication that offers more philosophical musings that are accompanied by visuals that tend to be cartoon-like. I found this particular work to be probably the most mystical in its orientation. It tends to suggest that there is some larger energy force at work that we can all tune into, if we only give ourselves enough attention to the world around us. I don’t know if I necessarily agree with this premise, but I have read some other works on mindfulness, especially as it relates to meditation, and I did find Sakugawa’s points to parallel these others. In this sense, her work attends to the necessity of slowing down and taking pleasure in finer moments when one can. Thus, this mindfulness enables to one to finding the path to becoming one with the universe. The various exercises that Sakugawa suggests that readers engage in seem a little far out for me, but I appreciated the unique perspective being offered here. So, I was compelled to write up a short review of There is No Right Way to Medidate: And Other Lessons just because I do engage some meditation primarily through yoga. Though many are skeptical of yoga (especially at first) due to orientalist appropriations, which I can understand, I have found the practice of yoga to be beneficial for two primary reasons: the focus on the breath AND the time that I have to devote to stretching (and I am still extremely inflexible after 6 years of regular practice, going around 3 times a week, sometimes more). Yumi Sakugawa’s There is No Right Way to Meditate: And Other Lessons takes as its topic the focus of meditation but explores this issue through a visual form that is reminiscent of Lynda Barry’s work (especially the “demons” visual project that Barry engaged). So much of meditation is about moving beyond your thoughts, which tend to be negative. Sakugawa draws this “negative energy” as a kind of black cloud monster who comes and feeds off of what Sianne Ngai might call “ugly feelings.” Meditation in whatever form lets you get away from your thoughts, so you can just be one with the breath. It’s difficult; I can’t ever meditate for more than a handful of minutes at a given time, but when it’s working, I feel so much better and so much more centered. What Sakugawa’s work adds to this kind of practice is a visual schema to understand why it is you need to meditate and injects a little bit of humor into encouraging us all to be a little bit more mindful, so that we can go about our day with less emotional and psychic baggage. A fun and cute production from Adams Media. 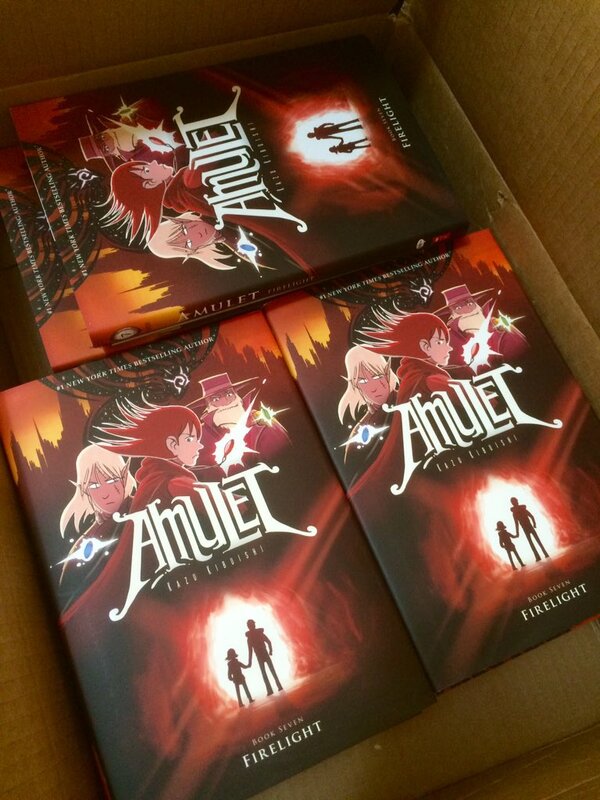 A Review of Kazu Kibuishi’s Firelight (Amulet #7) (Scholastic Press, 2016). Well, I absolutely adore Kazu Kibuishi’s Amulet series, but I am seriously beginning to wonder about whether or not we will ever see its ending. Perhaps, it shouldn’t have one, but the conclusion to Amulet #7 makes us realize that there could be many, many more installments to go before we see what happens to Emily and Navin, and their adventures in this fantastic world of mechanized droids, talking animals, dark elves, and stonekeepers. The very sparse overview over at B&N gives us this description: “Emily, Trellis, and Vigo visit Algos Island, where they can access and enter lost memories. They're hoping to uncover the events of Trellis's mysterious childhood -- knowledge they can use against the Elf King. What they discover is a dark secret that changes everything. Meanwhile, the Voice of Emily's Amulet is getting stronger, and threatens to overtake her completely.” I don’t really know if there is really a “dark secret that changes everything.” Pretty much everything we’ve been worrying about is taking effect and our central question remains the same: will Emily be able to control the power inherent in the stone or is she a pawn in some larger game. While B&N’s description focuses on Trellis’s childhood, in some ways, this particular installment is far more about Emily’s childhood and her melancholic attachment to her father. This connection is the one that we fear may turn Emily to the darkside. But the plot description completely fails to mention Navin’s subplot wherein he and his merry band of adventurers are working to reunite with the Resistance. An entertaining sequence involves Navin and his allies toiling in a skyship restaurant, but that’s merely dressing on the larger issue involving Navin and his quest to repel the forces of darkness alongside his mother and other faithful allies. As much as I am a fan of Kibuishi’s work, his tremendous output, and his regular installments, I do hope that the longer arc of this work will find a more original resolution. I’m already seeing it move toward that common “masterplot” I’ve seen in other comic books in which a good person becomes bad, who then must be defeated by someone the formerly good person loved (such as a brother in this case). The question in such plots is whether or not the formerly good person will end up living after the final cataclysmic battle, so I hope Kibuishi pulls the rug from out of under our readerly feet. He’s already staged a number of surprises, especially with the dark elves, so keep those twists and turns coming. A Review of Gene Yang (author) and Mike Holmes’s (illustrator) Secret Coders (First Second 2015). So, somehow I missed this publication when it originally came out, but Gene Yang is back, this time with Mike Holmes at the illustration helm with Secret Coders (First Second 2015). Our trusty summary over at B&N will get this review started: “Welcome to Stately Academy, a school which is just crawling with mysteries to be solved! The founder of the school left many clues and puzzles to challenge his enterprising students. Using their wits and their growing prowess with coding, Hopper and her friend Eni are going to solve the mystery of Stately Academy no matter what it takes! From graphic novel superstar (and high school computer programming teacher) Gene Luen Yang comes a wildly entertaining new series that combines logic puzzles and basic programming instruction with a page-turning mystery plot!” The biographical note that the summary provides is important in part because Yang’s point is to use this graphic novel as a method to teach readers about the basics of coding, especially in relation to binary code. Hopper arrives at Stately Academy as the proverbial new student who is looking to make friends. Though she has interests in basketball and seems to be relatively socially grounded, she finds it difficult to make new friends, which makes it all the more fortuitous when she strikes up a connection with Eni, the local basketball star. But, as they get to now each other, a central mystery emerges from the school’s supply closet/ tool shed (which is locked). After finding a way in, they come upon a programmable turtle, which is set to clean the grounds using a particular sequence of instructions, but these instructions can also cause strange birds (with multiple eyes) to attack. If this plot device seems bizarre, then you must be forewarned: there is something amiss at this school, as it is filled with electronic animals and robots as well as sallow looking people coming out of the principal’s office. Yang adds another interesting element into the plot by unveiling the fact that Hopper, who is drawn with racially ambiguous features, is the daughter of the Chinese language instructor, Mrs. Hu. To be sure, we are not given information about whether or not she is the biological offspring of Mrs. Hu, but Yang is clearly having some fun with the complicated issue of representing race in graphic form. Holmes’s illustrations pair well with Yang’s scribing efforts. For adult readers, Secret Coders might come off a bit frustrating, as the narrative is so short. This brevity is no doubt due to the fact that this work is being broken up into multiple installments, and this first portion naturally ends on a cliffhanger. Stay tuned, so shall we all.